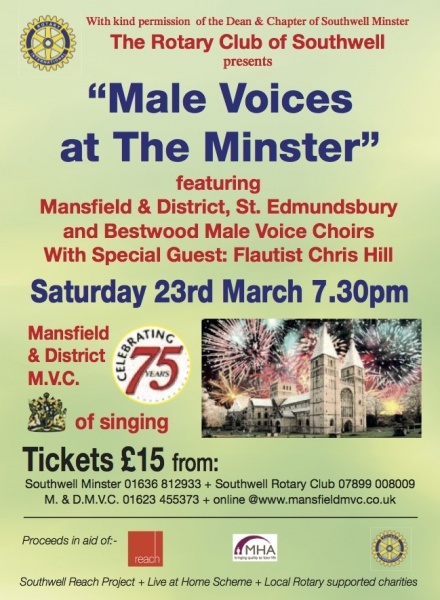 On Saturday 23rd March Southwell Rotary Club will present, with the kind permission of the Dean & Chapter, a Male Voice Choir Concert in the Minster. The combined Choirs of Bestwood, Mansfield & District and St. Edmundsbury will make a wonderful sound that shouldn’t be missed! Furthermore they will be joined by the flautist Chris Hill. The Concert forms part of Mansfield & District Male Voice Choir’s 75th Anniversary Celebrations, and proceeds will benefit local charities including the Live at Home Scheme and Reach Learning Disability. Steve Shatwell, Reach’s chief executive, said: “We are delighted to have been chosen as one of the benefitting charities. We rely heavily on voluntary income and the money raised from the event really will make a difference in the local area. The money will help us to support our clients to gain the skills and confidence they need to make a better quality of life in their community.” Tickets are available locally from the Cathedral Shop, 01636 812933 or Southwell Rotary Club, 07899 008009 at a mere £15 each. Enjoy good music and contribute to good causes at the same time !